Historically, the study of corporate social responsibility (CSR) reporting has largely been within the context of Western economies. However, in the wake of highly publicized incidents such as Bhopal and the struggle of the Ogoni people in Nigeria, many large corporations now claim to be taking steps to improve their environmental and social performance within developing countries. Using the lens of stakeholder theory, this book examines whether the current practice of CSR reporting in developing countries is motivated by a desire to discharge accountability to all relevant stakeholders or whether it is being driven by the imperative of advancing corporate economic interests. While concepts like CSR reporting have become more fashionable, they vary widely in different national contexts; this book therefore clarifies the types and roles of CSR reporting and the underlying corporate motivations. 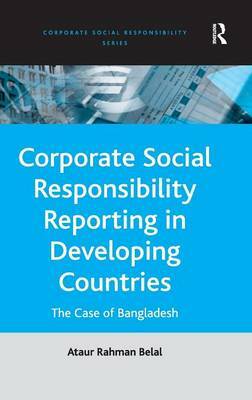 The author considers the current CSR reporting practices in a number of developing countries, with particular attention given to illuminating a case study of Bangladesh.